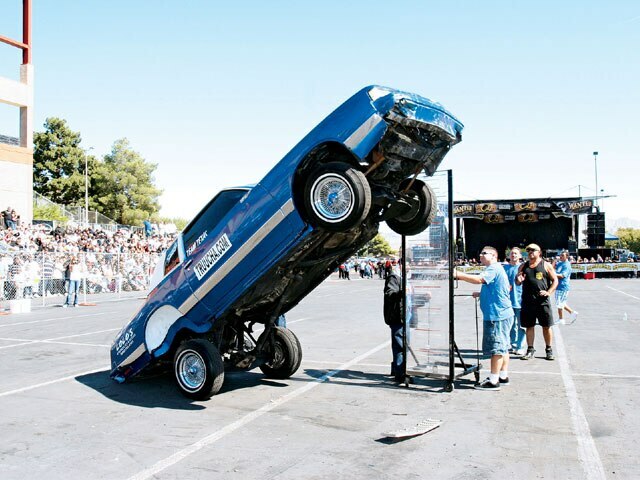 The Super Show Hydraulics Competition Once Again Delivers The Action. With a few changes in the rules for 2007, the radical days of standing on end were gone. 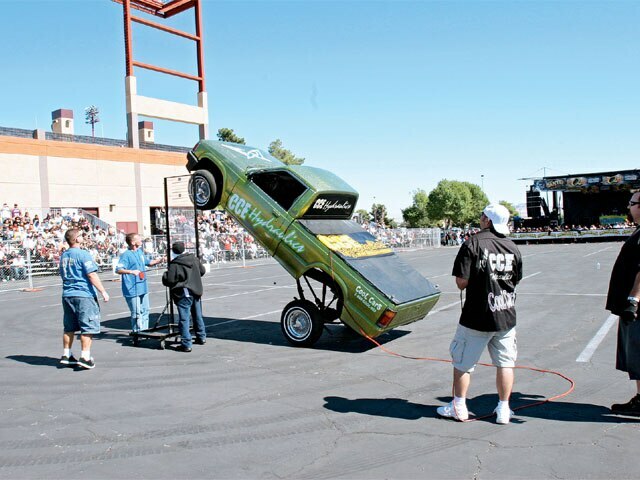 That rule made for the sport of true hopping to come back with a vengeance, and along with only five cars in each category being allowed at the Super Show, it made for a few heated shows prior to the Las Vegas, Nevada, Super Show climax. The 2007 Tour was one of the first where Tour records weren’t broken at the Super Show. 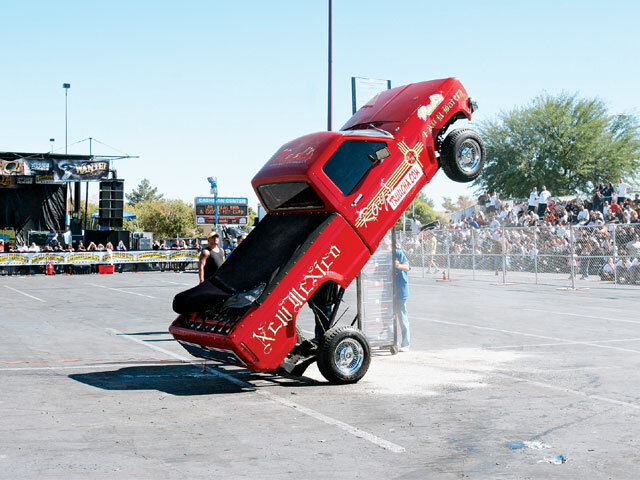 Rob Robertson broke the Radical Hop record earlier in the year and the new Single-Pump Hop record was set in Phoenix, Arizona, by Dave Marquez. That was only the second show of the year, so we knew that 2007 was going to be exciting. So this was it, the Las Vegas Super Show, the battle for all of the marbles and bragging rights until the start of the next tour. 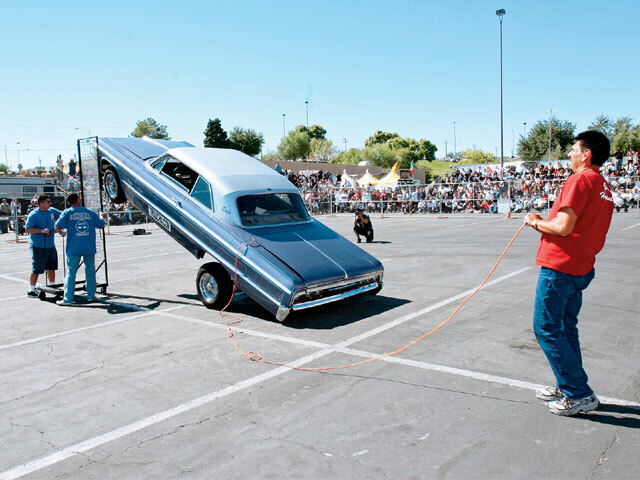 The Single-Pump Hop began with Ricardo Sanchez and his ’86 Chevy Caprice hitting 37 inches and breaking a switch in the process. Next up was Eppie Martinez from New Mexico with his blue ’64 Chevy Impala and he could only muster a 58 on this particular day despite a valiant effort. The previous year, Eppie hit 61 inches, good for a Third Place finish. The last two competitors in the Single-Pump Hop have been dueling it out all year, and even before that. In 2006, Shorty’s Hydraulics of Houston, Texas, and Dave Marquez slugged it out and Dave came out on top. This past year was no different, with Shorty hitting 69 inches. You can bet that Shorty will spend the winter months looking for that elusive inch and then some. The Double-Pump Hop action wasn’t quite as tight, but was equally exciting nonetheless. First up was the Black Magic Hydraulics’ Olds Cutlass with Ron Eggers at the switch. This time, Ron was only good for 68 inches, which didn’t place him in the top three, but he “swang what he brang” and in the end that’s all you can do. 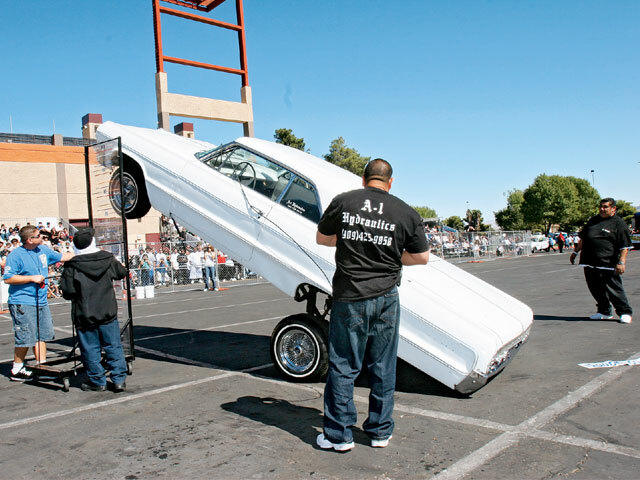 John Valdez rolled in with his white ’64 Impala and put up a 73-inch run, good for Third Place. 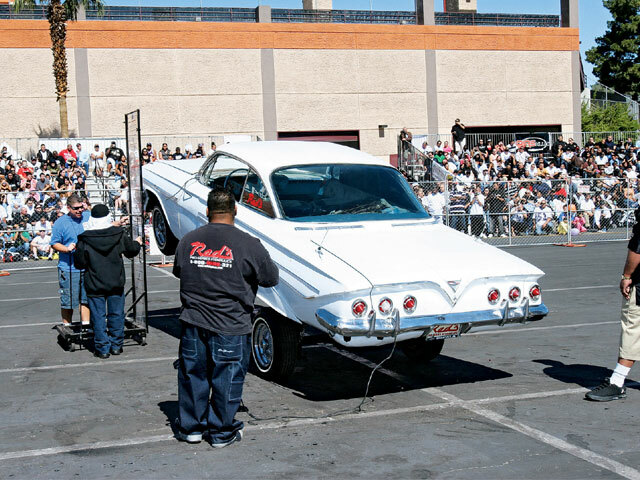 Mike Moreno had to put his ’61 Impala back together after it fell off of his trailer and into a ditch just a couple of weeks before the show. Despite the mishap, Mike got the car to Vegas looking none the worse for wear, but 58 inches was the best hit that he could get out of it. Dave Marquez was probably favored for Double-Pump, but Rogelio Loera and his ’97 Chevy Monte Carlo stuck their foot in the door and said not so fast. Rogelio put up a 76, tying the Tour record held by Dave, who was next up. Dave rolled in knowing that he had to throw up better than 76 to win, but could he make it happen? Well, he fell short of his record by four inches, coming in Second and tied for the record in the Double-Pump Hop. The Truck Hop saw only three contestants and they actually finished in the order that they performed. 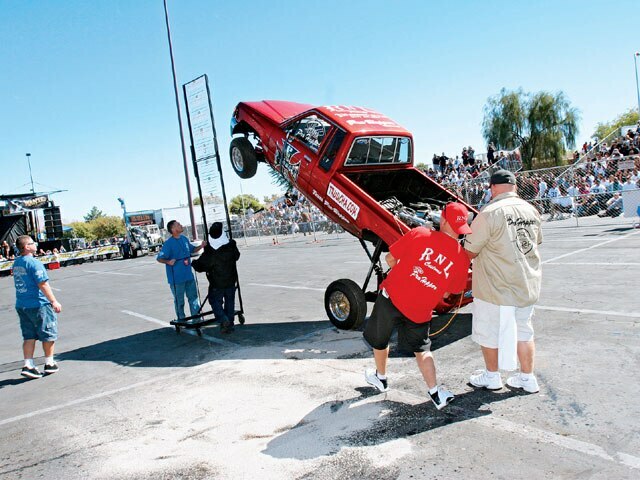 Bryan Gillespie and his ‘90 Mazda came in Third with 79 inches, John DaLaFuente and his ’84 Ford Ranger followed in Second with 87 and Shorty’s Hydraulics took First and the Tour record with 88 inches. The Radical Hop was next and the rule change guaranteed that there would only be some legitimate hopping going on. With that, the height from last year came down considerably. The current Tour winner won with 96 inches compared to last year at 136 inches. 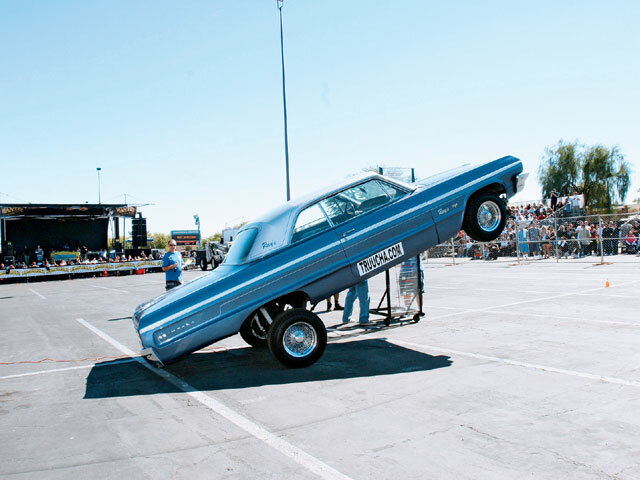 Shorty’s Hydraulics came out first with its ‘62 Impala and put up 86 inches, which was good for Second Place. An honorable mention goes to Victor Lopez who had done fairly well the rest of the year, but made the mistake of leaving his car in drive before Ron started hopping it. We’re sure that he won’t make that mistake again. Eppie Martinez came in Third with an 84-inch best. Rob Robertson traveled to seven shows this year and held the record for most of the season so he was ecstatic when he closed out his year with a win and the record. Having the dance portion being broken up into just Radical Dance and Street Dance made for a shorter program and, more importantly, quite a bit more competition. Travis Piper and his Chevy S15 came in Third Place with a score of 22. Juan Chavoya held his own all year, even with the stiffened competition, and his clean moves garnered him 28 points for Second. 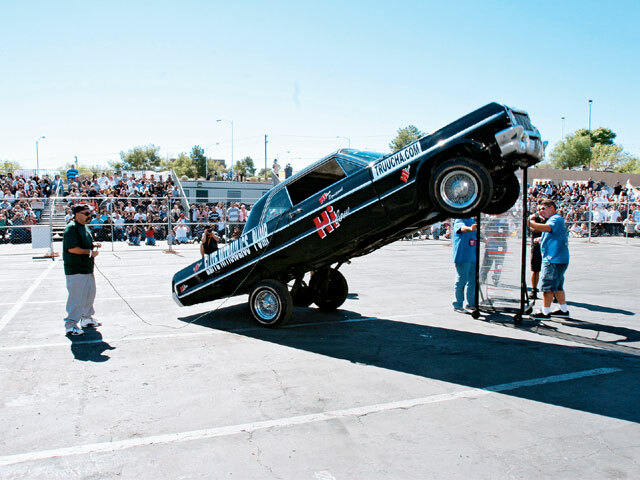 Shorty’s Hydraulics took First last year in Street Truck, and he must have turned up the juice. His ’84 Chevy Blazer, “El Mero Mero,” had power to spare and was doing front and back with enough power to almost throw the vehicle on end. It smashed the front bumper and rear quarter pretty well, and in the end, the judges were impressed and gave him 30 points and a First Place finish. The Radical Dance started out with Tony Casas and his ’84 Cutlass, which seemed to get off well enough to earn 20 points and a Third Place finish. For the Second and First Place winners, it seemed to be a matter of keeping their wheels on. The CCE Hydraulics ’87 Cutlass started its routine nice and smooth like ice, but in an instant it was missing it passenger-side rear wheel. But that didn’t stop Bryan from keeping it moving, which is what he had to do to not be DNF’d. So in spite of the rear wheel missing, Bryan put up a 24-point score, which was good for Second Place. If that was impressive, then the Black Magic ’94 Nissan Pathfinder, which placed First, was the icing on the cake. Ron also lost a wheel and continued his routine, even putting it on its side twice. It made for a great show for the spectators and we’ll probably be paying for the repaving of the parking lot after these two performances. There was a break in the action to give out the Wayne Costa Memorial Award. This year, the recipient was Clint Perkins. Clint’s laid-back and helping attitude made him a shoe-in for the award in 2007, which was presented to him by Wayne’s dad in an emotional moment. What’s the real deal for the hoppers and dancers is their dedication to the sport. They travel all over the country to hop and compete, and they spend quite a bit of money to do it. Fixing a car after each show is a money and time proposition. And then there’s the time that they’re away from home and their jobs or shops. For all of this, we want to take this time to thank everyone for their participation in the 2007 hydraulics competitions. The name of the game is to keep the bumper on the car. Team Texas went big and roped First Place. Eppie leans back for those extra inches. The chariots before the battle. Shorty’s ’64 going for Second Place. Here’s what Second Place in the Single-Pump Hop looks like. CCE Hydraulics with Bryan at the switches clinched the Radical Dance top spot. Dave Marquez on his way to First in the Single-Pump Hop. CCE snags Third Place in the Truck Hop. The judges do their final inspections of the year. Representing for New Mexico at the Super Show. Juan Chavoya held his own all year long. 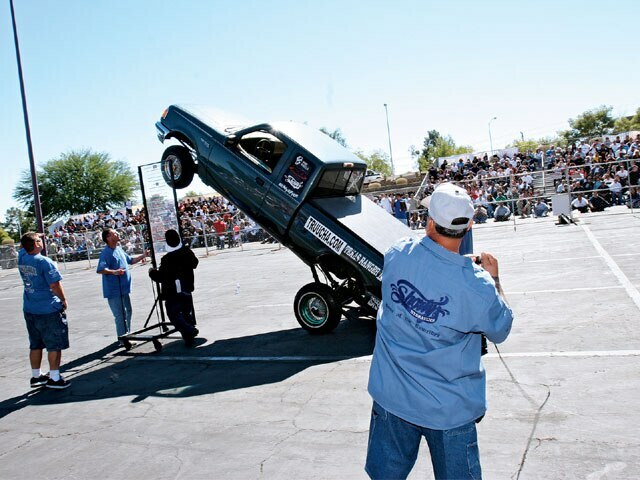 The Truck Hop winner and Tour record holder, Shorty’s Hydraulics gets high. King of the Radical hill. Not bad for a car fresh out of a ditch.